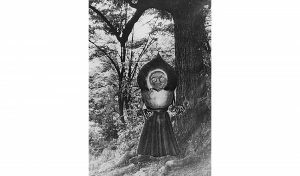 This photo montage by Gray Barker depicts the legendary Flatwoods Monster. HUNTINGTON, W.Va. — The strange 1952 case of the Flatwoods Monster has landed again in the national spotlight as the new History drama series “Project Blue Book” features an episode about the purported sighting in a new episode that airs at 10 p.m. tonight, on the History Channel. Episode 102, “The Flatwoods Monster,” features Dr. J. Allen Hynek (played by Aidan Gillen) and Captain Quinn (played by Michael Malarkey) investigating a West Virginia case of a woman and her two children who said they witnessed a flying saucer crash near their farm and an alien emerge from the fiery wreck. The series premiered on Tuesday, Jan. 8, to a strong audience. The show’s executive producer is Academy Award and Golden Globe winner Robert Zemeckis (“Back to the Future,” “Forrest Gump,” “Contact”), and the series is based on the top secret investigations into unidentified flying objects (UFOs) and related phenomena conducted by the U.S. Air Force from 1952-1969.